There's only one downside to getting new clothes for college. And that downside is obviously not having enough room to store all of these new clothes. Luckily, our Chrome dorm Closet Doubler gives you twice the closet space that is normally provided in dorm rooms. With 28'' of additional closet rod space, there's no need for you to leave any of your favorite shirts, pants, or jeans at home. Now if you could only get your college dorm room to be 28 feet bigger! The 32'' clearance of closet doubler will make it easy for you to hang up twice the amount of clothing without making your closet look twice as cluttered. When you're moving into your college dorm room, nothing is worse then unloading all of your clothes and realizing you can't keep all of them in your dorm room. Believe it or not, this type of thing happens all the time! Avoid clothing separation anxiety with our small dorm supply that provides huge space. Hanging up your clothes is always better than shoving them into storage bins. When you wake up late and need something to wear fast, opening up your dorm closet door and seeing all of your clothes is much faster than opening up drawers and bins. Space and organization, or clutter and too many dorm storage bins? The right choice is pretty obvious. 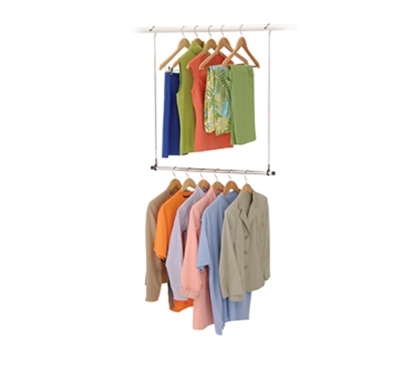 Get more space while hanging up more clothes with our clutter erasing dorm closet doubler. You may end up stuck wearing extra layers without adequate clost storage space!